A number of fi’zi:k-sponsored riders will wear a special edition R1B Climb shoe at this year’s Giro. In addition to being worn by the pros at the Corsa Rosa, a strictly limited edition run of just 40 pairs are available to buy at fizik.com or from the company’s leading dealers worldwide. The design on the R1B Climb Edition upper includes the contour of the iconic Monte Grappa and Asiago climbs. They are amongst the toughest tests the world’s finest racers will face this year as they take on the climbs during stage 20 of the 100th Giro d’Italia. “The Giro is a special race for all riders, and this year riding in Sicily will be one of the inspiring stages for sure,” said Salvatore Puccio, who lines up for the Corsa Rosa with his Sky team-mates for the fourth time. Puccio’s Team Sky co-leader Geraint Thomas, among the favourites for overall victory at the Giro 100 was one of the riders pro riders to wear the R1B, and will adopt the Climb Edition this year. The R1B brings together brand new technologies specifically engineered by fi’zi:k.
It includes a unique new shoe fitting technology called Volume Control, which ‘enables each shoe to be precisely fitted to the rider’s feet, accurately and easily’. The shape of each shoe can be changed individually. Using a pair of Boa IP1 dials on each shoe, riders can tighten the grip to increase power transfer, and can quickly adjust their R1B’s fit. The R1B’s outsole is uni-directional carbon fibre, with built-in ventilation that further enhances both cooling for rider comfort and the aerodynamic properties of the shoe. The outsole combines with the supportive fi’zi:k Cycling Insole to ‘ensure that every precious watt goes straight into your pedals’. Alongside this, sculpted footbeds and supportive heel forming keeps feet securely cradled helping to avoid any hot spots or crush zones. 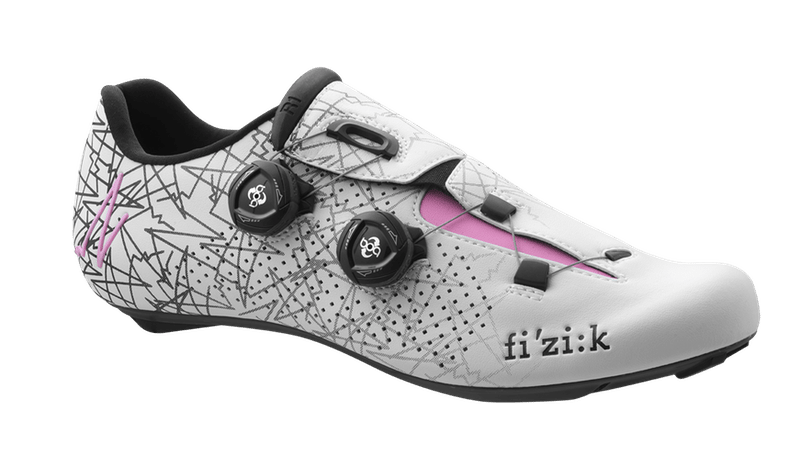 fi’zi:k R1B shoes are priced at €350 (US$430, £329). A strictly limited edition number of just 40 pairs of fi’zi:k R1B Climb Edition are available to order either direct online from fi’zi:k or from leading dealers worldwide.